Starting solids with Lily. I’ve relied on baby food pouches vs. making my own purees because let’s face it, I don’t have time for that! I’ve also been feeding her whole finger foods along with these purees— some call that baby led weaning! You can read more about our starting solids journey here. On the go with the toddlers! Whether we are on our way to Nana and Grandpa’s house, attending Sunday mass, or sitting on a park bench, I almost always have a pouch for each boy on hand. I’ll also have a whole piece of fruit or snack bar to offer as an option as well. Let me start of by saying baby food pouches are NOT a replacement for the real deal. The real deal being whole foods that you sit down and enjoy with your family. However, I do think there is a time and place for them, and I appreciate the option being available for me to purchase when in a pinch! There’s something to be said about a child learning to eat. Yes, it is about nutrition. But eating is also a learning experience for children explore new foods, tastes and textures. So if we are ONLY giving our babies and toddlers food in the form a puree, what happens when they are presented a plate of foods in natural form?! With many baby food pouches from brands and flavors on the market, I decided to sit down and do a comparison of the one’s we are likely to have on hand. The biggest thing to note is these have zero added sugar or salt in their food mixtures. Most baby food pouches that contain fruits and vegetables provide a good amount of Vitamin C, A, and E, which are important for boosting your child’s immunity and maintaining healthy cells. Baby food pouches made with plant or animal foods [think pureed chicken, beef, beans, quinoa, etc.] contain protein, which is important for growth and development. The amount of each nutrient depends on the pouch— so be sure to check the nutrition facts label! Also, all of these pouches cost different prices [not by much, so if you want to buy baby food pouches, be sure to choose one that’s best for your budget! The fruit and vegetable pouches are made from nothing but certified organic fruits and vegetables, they don’t even add water to their blends. There is a wide selection of protein-packed purees such as chicken casserole with vegetables and vegetable back with lentils. The fruit and vegetable purees include single food purees to combination pouches, plus textured meals and toddler snacks like carrot and lentil multigrain sticks. They have products available for those children following a special diet like gluten free, lactose free and vegetarian. Company has 4 main product categories: applesauce on the go, yogurt on the go, fruit and veggie pouches, and organic applesauce pouches. The fruit and vegetable squeeze pouches are made mainly from whole fruits and veggie but some juice concentrate is added. The yogurt pouches are made with reduced fat milk + Vitamin D.
Brand offers a wide variety of baby food pouches for 6 and 9 months of age. Those pouches designated for 9 month olds have 3+ foods mixed in the pouch. Earth’s Best places a strong emphasis on the quality of their products and the fact that they are an organic food company protecting the earth through sustainable farming practices. NOTE: This is NOT a huge purchase point for me. But I know it is for some so I thought it was important to mention. Plum Organics has one of my favorite food pouches for toddlers: Mighty 4 Blends. These are a blend of pureed fruit, vegetables, grains and protein, and have things like chia seeds, barley, amaranth and quinoa added to them. They are also higher in calories than most baby food pouches, about 100 calories per pouch. Plum also has a cool baby food line dedicated towards eating a specific blend of colors [think red: beets, apples, red bell pepper pouch mix] and growing well [think a pouch flavor combination dedicated towards muscle, bone, and tummy health]. Hello smart marketing! Ok so this isn’t really a review of Gerber’s baby food pouches as much as it is a nod to their website and resources [link above]. There’s nothing more to be said about baby food pouches as my last brand. 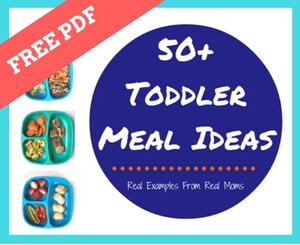 Gerber has some awesome resources for both the health professional and parent on their website regarding feeding young children. I will also note that by doing a price comparison in the store, Gerber has an organic and non-organic food line. The non-organic is less expensive, and more often than not, it’s less expensive than any of the other brands I’ve listed. Does it mean it’s less nutritious? Heck no! A carrot is a carrot people. As you can see there’s NOTHING too different about these brands or products. You can feel good about feeding your baby or toddler any one of them. If that means squeezing a little on a baby spoon or giving your toddler one while waiting at the doctor’s office then so be it! Know you’re not alone— because I do it too! I’ve only listed 5 here, but if you have another favorite baby and toddler food pouch I haven’t mentioned please share! The boys would love to add a few more to our pantry…. We are a huge fan of the Cold Puree pouches by BeechNut! I need these!!! I love BN jars. Where did you find? Thanks for your educated response! Don’t listen to Ashley, I enjoyed reading this article. We try do use the packets as a supplement to his regular diet. We have a tendency to mix up all the brands as they go on sale at our local markets, Kroger and Meijer. Meijer tends to have the better selection to choose from.